These proceedings contain the papers of IFIP/SEC 2010. It was a special honour and privilege to chair the Program Committee and prepare the proceedings for this conf- ence, which is the 25th in a series of well-established international conferences on security and privacy organized annually by Technical Committee 11 (TC-11) of IFIP. Moreover, in 2010 it is part of the IFIP World Computer Congress 2010 celebrating both the Golden Jubilee of IFIP (founded in 1960) and the Silver Jubilee of the SEC conference in the exciting city of Brisbane, Australia, during September 20-23. 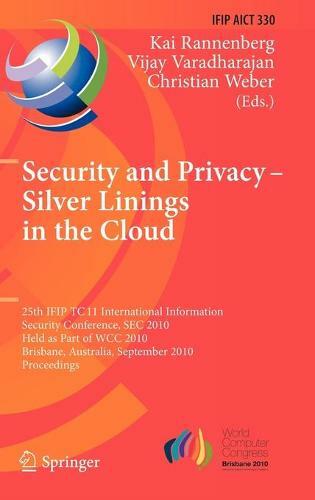 The call for papers went out with the challenging motto of "Security & Privacy Silver Linings in the Cloud" building a bridge between the long standing issues of security and privacy and the most recent developments in information and commu- cation technology. It attracted 102 submissions. All of them were evaluated on the basis of their significance, novelty, and technical quality by at least five member of the Program Committee. The Program Committee meeting was held electronically over a period of a week. Of the papers submitted, 25 were selected for presentation at the conference; the acceptance rate was therefore as low as 24. 5% making SEC 2010 a highly competitive forum. One of those 25 submissions could unfortunately not be included in the proceedings, as none of its authors registered in time to present the paper at the conference.